Discover how long you long for the past. Glides comblastious. Ascension in bled-red lather. Pax. The beauty of this poetry is, in turns and in combinations, delicately exquisite, clunky, multivalent, polyphonic, portmanteau, kenning, punning, colloquial, arcane, gently lyrical, neologistic, allusive, and (pervasively) playful. Her puns and neologisms are themselves mini poems: from one poem, “caligulations,” “regretitude,” “neocoinjoinings” (the latter, alliances of neocons devoted to money). This poetry extends the tradition of rich poetic language flowering in Gerard Manley Hopkins and Joyce in Finnegans Wake, rooted in Keats and Shakespeare. Like Joyce, Fitzgerald sometimes sounds like Hopkins. “Whatsun, donesun … Smokebrick, … scumblight, / Stunsunk, stardark” – words from “Céilidh,” a treasure of lovely, enlivening sound and varying-lovely rhythms, which evokes Hopkins because he was the first ecological poet and this poem concerns the eclipse of nature as “Forest fires smoke city air” in a “human blaze” that is global warming and more. 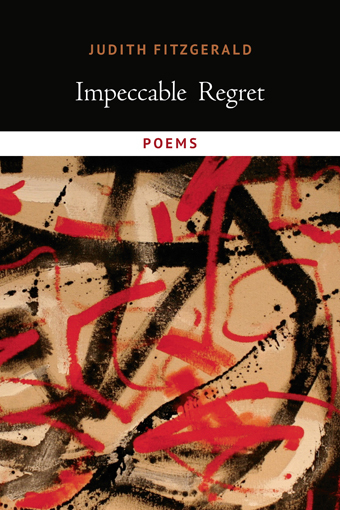 So these poems are modernist in immediate intrinsic form as well as message (cultural loss), through their intrinsic forms (lyric length, verse-lines, stanzas) are largely conventionally pre-modernist. Many of these poems retain for me unsolved mysteries, an aspect of their vitality, but rereading expands and deepens understanding. To comprehend most of them (you will, if you like me, need to) read each one three times before moving on to the next – so that you can say with her, “we/did time/between/the lines.” Why bother? Because so many of these poems are major.